Lumos is honoured and delighted to have won the overall Charity of the Year award at the prestigious UK Charity Awards 2015, held in London last night. Our entry was based on our long-running project to create a new and truly inclusive education system in Moldova for thousands of children with disabilities. It so impressed the judges that they chose Lumos not only as the best charity in the International Aid and Development category but as the best overall in a finals event featuring 30 excellent UK charities. Lumos CEO Georgette Mulheir and Lumos Moldova team director, Dr Irina Malanciuc, received the awards. You can read a report about the event, with pictures and comments from Dr Malanciuc, on the website of the organisers, Civil Society Media here. 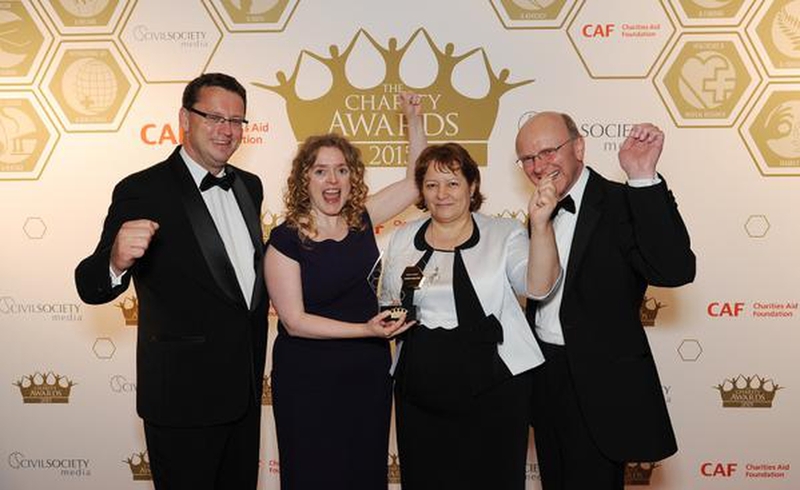 The Lumos Foundation founded by J K Rowling beat charities from all over the UK to win the most prestigious accolade in the UK charity sector at The Charity Awards 2015. It first picked up the International aid and development award before going on to scoop the top prize of the night – Overall award for excellence. Rob Wilson, Minister for Civil Society presented the winner's trophy to Georgette Mulheir and Dr Irina Malanciuc at a glittering ceremony last night at the Park Plaza Hotel, Westminster. The Charity Awards, organised by Civil Society Media, recognised Lumos Foundation for it's work to end systematic institutionalisation of children around the world and in particular for their work in Moldova, Europe’s poorest country with one of the highest rates of children separated from families and placed in institutional care. In 2007, with support from Lumos, Moldova’s government pledged to reform childcare, closing institutions and replacing them with family and community-based services. The charity found that while non-disabled children were easy to place back into families, disabled children faced being left behind. These children were suffering from neglect, under-stimulation and stress as a result of their institutionalisation, which would have a profound effect on their development and future life prospects. By the end of 2012 the number of institutionalised children in Moldova had reduced by 62 per cent, but this still left around 4,000, with 45 per cent of those disabled. The government has now drafted a new action plan for de institutionalisation for the period up to 2020.